Imagine living in a town or neighborhood where a serial killer is on the loose. The killer’s primary weapon is a pipe bomb filled with small metal projectiles like BBs and nails. The bombs are designed to kill and maim those in the vicinity of the explosion. The killer’s weapons are usually aimed at male targets, but quite often several others in the vicinity are also killed, including women and children. Oftentimes, a note is sent to the media after the attacks warning of future attacks unless the people being targeted give in to the killer or killers’ demands. The fact of the attacks’ unpredictability has created a perennial fear in the region, leaving every resident uncertain of their future and their family’s safety. Now imagine the killer is the United States military and CIA. The pipe bombs are armed drones packing explosives powerful enough to kill everyone within a few hundred meters. Although the drones are not randomly aimed, the appearance to those targeted on the ground is that they are. In other words, nobody in the targeted vicinity knows when or exactly where the drone will hit and who it is intended to kill. In response, the local residents of the targeted area stay inside, not sending their children to school or going to work all the while hoping their families will not be murdered in the next attack. Then the drone strikes, killing at first a man and his fellow tea drinkers. The screams of the wounded and dying attract his neighbors, who go to retrieve the wounded. Some approach quickly while others much more tentatively, knowing of the likelihood of a second drone strike designed to kill the rescuers. Then, the silence. 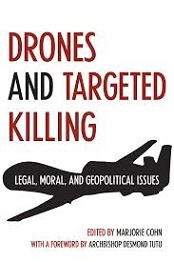 Since the use of killer drones by the United States began, more than 3500 people have been killed. Many of those killed were civilians. The number of civilians killed depends on how one counts civilians. The US government tends to consider every male in a targeted area over the age of fourteen to be a militant (itself a rather ambiguous term) and does not count their deaths as civilian deaths even when it is clear they were not involved in hostilities. If we were to apply this metric to the deaths that occurred when the planes flew into the WTC on September 11, 2001, then it seems safe to assume that the number of civilian deaths in that event would drop quite a bit. I am not suggesting that we do this, merely pointing out that the statistics regarding deaths by drone published by the US government (and related corporations) are self-serving and, at best, only somewhat truthful when it comes to the numbers of civilian dead. Marjorie Cohn is an attorney who teaches both international human rights law and criminal law. She is a former head of the National Lawyers Guild and the editor of the recently released book Drones and Targeted Killing: Legal, Moral, and Geopolitical Issues. This text includes entries written by attorneys, religious leaders, antiwar activists and others. The writers, while predominantly from the United States, also include (among others) Bishop Desmond Tutu from South Africa and human rights activist Ishai Menuchin from Israel. As the title indicates, the essays cover the topic of assassination by drone and Special Forces hit squads through a variety of prisms. However, the primary prism is the prism of international law. The unanimous consensus of every writer is that these killings are illegal by virtually every measure and precedent that exists in the field of international law. From Richard Falk’s academic destruction of the US government’s rationale for its policy to activist Medea Benjamin’s much more personal and emotionally wrenching tale of the murder of Karim Khan’s children in a drone strike on December 31, 2009 in northwestern Pakistan, Drones and Targeted Killing makes a cogent and powerful argument demanding an end to this most recent tactic in Washington’s war on the world. Investigative reporter Alice K. Ross expands on the proposition put forth by other writers challenging not just the lack of official documentation but also the criterion used to determine casualties in the documentation that does exist. Other writers compare the killings point-by-point with established just war causa bellis and international law only to find the drone assassination policy sadly lacking. Begin with description of Israeli assassination and us opposition. This entry was posted on Saturday, January 17th, 2015 at 12:02 pm	and is filed under Human Rights. You can follow any responses to this entry through the RSS 2.0 feed. Both comments and pings are currently closed.